There's something in the air on the set of "True Blood" -- rumor has it that two more cast members have made a love connection! 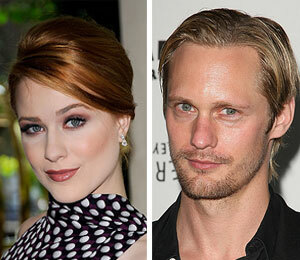 Sources tell Perez Hilton that Evan Rachel Wood (vampire queen Sophie-Anne) is cozying up to "Blood" vampire Alexander Skarsgard (Eric Northman)! But there's no confirmation that Evan and Alexander are officially an item. "True Blood" co-stars Anna Paquin and Stephen Moyer announced their engagement earlier this summer. Tell "Extra" -- Is the new rumored hookup hot or not?